Our world can seem so real and important sometimes, but scripture reminds us that our world is temporary. Everything in it as well, the people and the troubles, even the good things, too. We can be lulled into the sense of security by trusting people who tell us good promises. We can follow those who we think are powerful or influential. When we fix our eyes on the Lord, however, we see things from a different perspective, an eternal one. No matter how many days someone spends on earth here, it is nothing in perspective to the eternal God. His days are unnumbered. Our most powerful men and women are nothing compared to the power of God. It can feel easier to trust in the strong people in the world than an unseeable God, but only when we don’t know the One True God. As we seek Him and He teaches us about Himself, we are not only preparing for eternity, but we are learning to live each and every day more and more believing Him. God is working to bless the world and bring freedom to His children. When we see others who are doing good works, bringing about good things for other people, it’s the Lord we honor and celebrate. He is a good God who knows how to give good gifts. While this thought can sometimes seem to be such a downer, it is actually full of hope. It’s not about moping because time here is so short. It’s about recognizing that there’s more beyond this; that we’re a part of something bigger and something awesome. God is there and will be there and is greater than all that we see. As good as this life can be, it gets better. And when this life isn’t good, remember that it’s only temporary. God is the constant through all of it and we can trust Him. All the oppression will be lifted in His name, and in His time. The wicked who seek selfish gain at the expense of the suffering will be turned on their head! 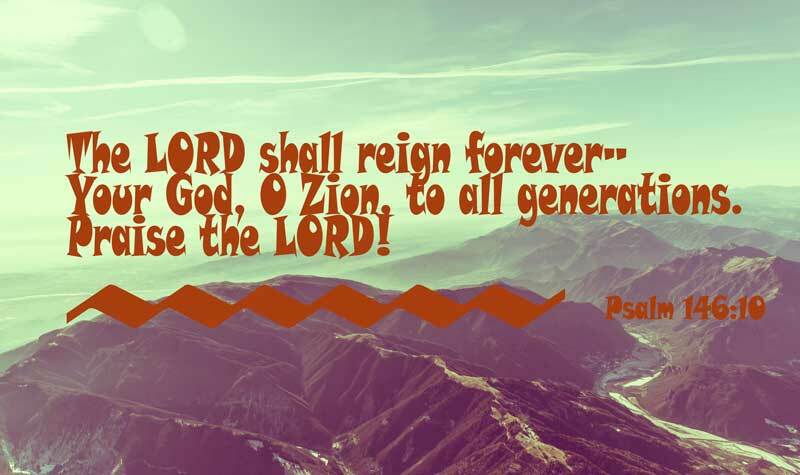 Nothing will dethrone the Lord from His high and mighty place, no person and certainly no sin. Praise the Lord for showing us His mighty works! God’s mercy can be defined as: the desire of God to see His children have goodness and blessing in their lives instead of what they actually deserve. We know that God’s mercy is there and we need it, but we may not think of it as the protection that it is. In Genesis, after Adam and Eve have eaten the forbidden fruit, they feel naked and ashamed to see God. As far as the scriptures record nothing changed other than their perception. It was the act of disobedience that enlightened their eyes to see their own vulnerability as a part of their separation from God. We are also vulnerable because of our separation from God. Ever since the fall, we have been open to the attacks of the devil against us. Cain was only one generation after the most perfect garden on the earth was created. He was the son of a man and woman who had personally walked and talked with the Most High God. Yet, he gave in to temptation and killed his brother. No one is exempt then or now from the dangers of sin. The response of God to the vulnerability of Adam and Eve can give us hope for our own needs of mercy. In God’s mercy, He provided Adam and Eve with clothing. It may seem like a small thing, but what it shows us about our God is huge. First thing it tells us is that God cares about meeting our needs, even when we’re working through problems. Adam and Eve had never had a need for clothing. The most likely wouldn’t have known how to make clothes or even what would happen to their poor bodies if they didn’t get them. But God, knowing the why and the what of their clothing needs, provided good, durable clothes for them. Animal skins make clothes that have protection and warmth. God didn’t give them wimpy clothes just to tide them over until they could figure it out for themselves. He gave them a good gift, because of His mercy. The second thing we can learn from this is that the sin we’re doing doesn’t stop Him from providing for us. The only reason Adam and Even needed clothing was because they had sinned; they didn’t deserve to be provided for. But God’s mercy is because of who He is, not because of who we are. He gave them protection and comfort because He loved them. Our God is merciful to sinners, which covers all of us. His mercy is beyond what we can comprehend or think, and He showers it on us because He knows how to give good gifts. He delights in it, in fact. Knowing this about our God makes it easier to trust His gifts and His kindness. We often feel ashamed and want to hide in a bush like Adam and Eve did, our poor vulnerability and shame underneath poorly held together leaves. But God comes in and finds us and loves us and gives us the gifts we need, even while dealing with the consequences of our sins. When Adam and Eve realized they were naked, the immediately tried to cover themselves up by making leaf clothing. They didn’t want God to see them as they suddenly saw themselves. We do the same thing in our hearts when we realize a sin. We feel like there’s been a huge change and we say, “How can we let God see us this way?” Of course, God has seen us as we are all along. Our sudden awareness of our sin doesn’t affect His. Even though we often know this, we still try to cover up the things we’re ashamed of before we go to Him. We hide in uncomfortable shrubbery to try to avoid facing Him in our newly aware and vulnerable state. Moved by mercy once again, He doesn’t leave us in our hidey hole or demand that we clean ourselves up and present ourselves to Him. Instead, He comes and finds us in our shame and nakedness and talks to us about what we’ve done. He is so good and kind and He loves us so much. The more we can trust in His mercy, the sooner we’ll run to His arms instead of hiding from His voice. 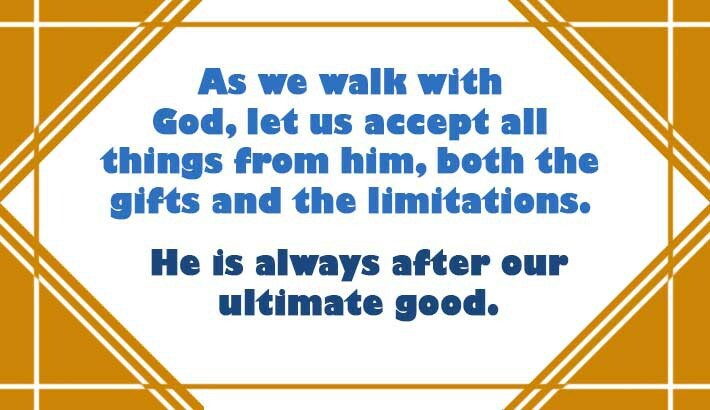 9 but he said to me, “My grace is sufficient for you, for power is made perfect in weakness.” So, I will boast all the more gladly of my weaknesses, so that the power of Christ may dwell in me. Our version of what we need is very different from God’s version. God knew that the leafy loincloths that Adam and Eve had made for themselves were not what would be the best option. Instead, he offered them ones made of skin. Perhaps that made sense to them, perhaps it didn’t. Either way, we can find ourselves in the same place as they did, receiving something from the Lord that doesn’t look like what we thought it would be. We have to be listening to Him and learning from Him so that when he hands us a gift, we can accept it without hesitating. Paul talks about receiving a different answer than he wanted in 2 Corinthians. He prayed that the thorn in the flesh would be taken away, but God told him no. God could show more power in Paul’s weakness than in his healing. Paul’s response shows someone who trust in the mercy and goodness of God. He doesn’t moan and become a martyr; he accepts the gift even to the point of boasting in his weakness to more thoroughly show the power of God. Maybe it’s the Lord saying no to you or maybe the Lord has just given you a different answer than what you expected, but God is giving you good gifts. He is offering you the protection that comes from trusting in His mercy and goodness. The Holy Bible: New Revised Standard Version. (1989). (Pr 28:13). Nashville: Thomas Nelson Publishers. The Holy Bible: New Revised Standard Version. (1989). (Ge 3:8-12,20). Nashville: Thomas Nelson Publishers. The Holy Bible: New Revised Standard Version. (1989). (Micah 7:18). Nashville: Thomas Nelson Publishers. The Holy Bible: New Revised Standard Version. (1989). (2 Co 12:9). Nashville: Thomas Nelson Publishers.